1994 has proved fatal for more drivers than Ayrton Senna and Roland Ratzenberger. Figuratively speaking, it destroyed the F1 careers of Karl Wendlinger and Jyrki Jarvilehto as well. Lehto's early career promised well, Lehto having a subscription to championship titles. In three years between 1986 and 1988 he notched up the Scandinavian and European FF2000 titles and ran away with the British F3 Championship. Much was expected of the successful combo of Lehto and Pacific when they decided to move up to F3000 together. But life wasn't as easy in F3000, the Pacific team never really on the pace, with Lehto also having to face up to the fact that his team mate Eddie Irvine was the quicker of the two on most occasions. JJ's end-of-season Onyx F1 opportunity came as a welcome present, for he salvaged his waning reputation by two terrific qualifying performances, well up the grid in 17th. This led to his first full season with Mike Earle's outfit but the season went bad early when the involvement of Belgian Jean-Pierre van Rossem turned sour and the team went into a steep decline, which thankfully was ended prematurely after Hungary. Lehto lived through the entire saga and was lucky to be picked up for next season by the promising BMS Scuderia Italia outfit of Beppe Lucchini and Giampaolo Dallara. Dallara's tidy chassis worked well with the compact Judd engine and Lehto regularly qualified near the top ten. A terrific third at Imola was a just reward for both team and driver. Alas, it later proved to be JJ's best ever result. The 1992 season saw the team slip back after it took over the Ferrari customer supply from Minardi. Although the V12 wasn't short on power it didn't suit the Dallara and the year was effectively a waste. Lehto's luck then seemed to turn when Peter Sauber hired the Finn alongside Karl Wendlinger. But a points-scoring and fast qualifying start to the season was followed by internal division within the Sauber team. Thus it came as a surprise that Flavio Briatore took him on after Riccardo Patrese had said goodbye to the Grand Prix scene. Still highly-rated, he was generally thought to be the perfect man for the job. But when he broke his neck in a pre-season testing crash (a bad omen that at the time was painfully neglected) his F1 career was effectively over - though it took the full 1994 season to really sink in. For the first two races he was happy to let Dutch testing sensation Jos Verstappen do the honours. For Imola he felt he was fit enough. He qualified an encouraging 5th but then fate - pre-empting even worse events - struck on the grid: he stalled and was hit from behind by Pedro Lamy's Lotus. There is still speculation that the ensuing pace-car situation, allowing tyres to cool off, was largely responsible for Senna's fatal excursion at Tamburello - it must be a frightening thought to live with. After Imola things went really bad for Lehto: his qualifying wasn't up to standard anymore and after six races Verstappen was brought back in. In a team firmly set up around Schumacher one could say that both Lehto's and Verstappen's bright career prospects were shattered during that most horrid of seasons. 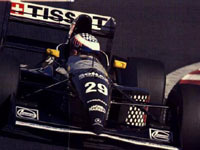 The picture shows JJ's final comeback at Suzuka, reappearing at Sauber in that famous reshuffle of seats at the end of 1994, after which he disappeared through the back door. His post-F1 life ranges from a DTM/ITC drive with Opel in 1995 to a rather downcast debut year in the '98 CART series, Carl Hogan probably betting on another 'Zanardi' but coming up empty. In between Lehto shone in GTs, however. In Ray Bellm's McLaren F1-GTR he co-won the Suzuka round of the final BPR Championship and together with Steve Soper he was a class act in the inaugural FIA GT Championship for Schnitzer McLaren, narrowly missing out on the title. The unmistakable highlight of his GT career is his 1995 Le Mans win, when he shared a Japanese Lark McLaren with Yannick Dalmas and Masanori Sekiya.